Have you ever wondered how the crew would leave a ship in an emergency, once the lifeboats with passengers are deployed? In larger ships, they would use something like the Marine Evacuation System shown in this video from MSC Cruises. It shows their crews training to use the system aboard a Fantasia-class ship. Technical training has already begun by crew members aboard MSC Divina, the next ship in the class, which is under construction at the STX France yard in Saint Nazaire (France). That includes the deployment of the MES, and what they learn is practiced every week. There are two of the systems aboard each of the Fantasia-class ships. They would normally be used to evacuate crew members in liferafts after passengers have filled the lifeboats. Each system deploys four of the giant, enclosed, inflatable liferafts, meaning that together they will accommodate 1,514 people beyond the capacity of the lifeboats. Marine Evacuation Systems are found aboard MSC Divina, MSC Fantasia and MSC Splendida. MSC Divina will be christened in Marseille on May 26, 2012. STX France says that Viking River Cruises has withdrawn from the discussions they were having with the yard regarding the construction of two 41,000-ton oceangoing vessels for a new division the line has been planning to create. The contract was to have included an option for a third vessel. The two companies jointly announced a preliminary agreement to build the vessels last December, subject to completion of contract negotiations. The vessels were to have been delivered in the spring of 2014 and 2015. There have been rumors in recent days that the discussions were stalled due to an issue with financing. There are also rumors that Fincantieri is interested in stepping in to build the vessels. It is not known if Fincantieri is able to offer some sort of financial package. Azamara announced this afternoon that they will cancel the April 12 sailing of Azamara Quest in order to complete repairs of the propulsion system which was damaged in the fire during the last sailing. Customers booked on the April 12 sailing will receive a full refund along with a future cruise certificate in the amount of 30% of the cruise fare they paid for the April 12 sailing. Presumably there were passengers who had booked multiple segments. We are awaiting word from Azamara on how those customers will be handled, details of the repairs to the ship, and if Azamara Quest will resume its repositioning sailing from Mumbai on April 12. Azamara tells CND they are not, at this point, absolutely confirming that the April 24 sailing will operate as scheduled. "We are currently focused on the April 12 sailing," the spokesperson told CND. "No decision has been made regarding any other sailing other than April 12," she said. There were passengers who had booked multiple segments that included the April 12 sailing, and Azamara is working with them individually on their options. Azamara said the ship will be repaired in Singapore, but details as to the logistics are not yet available. 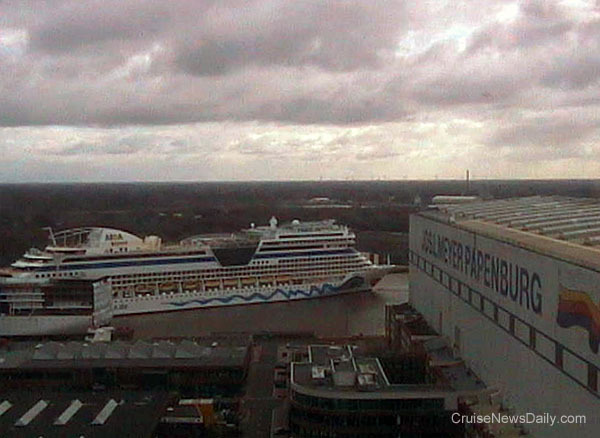 Early Sunday morning (April 1, 2012), Meyer Werft floated out AIDA's next ship, AIDAmar. The speeded-up process can be seen in this time-lapse video provided by AIDA. Some of our readers who couldn't make the trip to Papenburg got up in the middle of the night (in the US) to take in the operation on Meyer Werft's webcam. The photo below is an example of what they saw on the Meyer website. When AIDAmar was towed into this area, viewers got a bit of a preview of AIDA's next vessel. Prior to towing AIDAmar out of the building dock, an unfinished section of AIDAstella had to be moved out of the way. It can be seen here just off AIDAmar's stern. It will become part of the bow of the new ship (You can match it up with the shape of AIDAmar.) It was later towed back into the dry dock. AIDAstella will be delivered in about a year. AIDAmar's conveyance down the Ems River is planned for April 13, weather permitting. It will be christened in Hamburg on May 12. 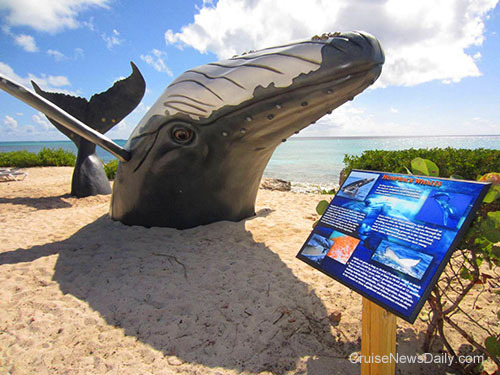 Visitors to Carnival Corps Grand Turk Cruise Center who go to the facility's 800-foot private beach are going to see something new that will give them pause: a giant sculpture of a pair of humpback whales breaching in the sand. The massive 12-foot-high by 38-foot-long sculpture was created for Carnival by California-based Storyland Studios. Adjacent to the sculpture is signage that gives visitors facts about the whales and photos of them in the wild. Carnival Magic contacted the US Coast Guard the evening of March 31, 2012, requesting a medical evacuation for a 44-year-old woman who was a crew member and experiencing complications with a pregnancy. The Coast Guard launched an MH-65 Dolphin helicopter crew from Air Station Houston. They met the ship when it was approximately 145 miles southeast of the Galveston coast. They hoisted the woman from the deck of the ship, as seen in this edited video of the operation, and took her to the University of Texas Medical Branch in Galveston. The video begins with the helicopter aligning itself with the ship below as the rescue swimmer is being lowered to the deck. There's an edit, because in the next scene the patient is ready to be hoisted from the deck. In real time, it took a couple minutes for her to be brought out and connected to the hoist. You can hear the progress reports where her position is being called out as she is being lifted to the helicopter. While she is being lifted, the wind has shifted, and the pilot can be heard asking for the ship to be told to turn 45-degrees before they bring the rescue swimmer up. Meanwhile, he turns the helicopter to compensate, but he wants the ship to turn so it will be aligned correctly for the next hoist. As you can tell, there is another edit, because the ship is suddenly realigned below when the rescue swimmer is being hoisted. The video ends as the rescue swimmer comes into the door of the helicopter, but the mission continued for another two hours until the woman was delivered to the hospital in Galveston. They make it look so easy.